The Xinhai 辛亥 year of 1911-1912 marked the failure of an ambitious, although tardy, program of political reform launched by the Qing court, China's last imperial ruling house. It was a year when an ill-conceived bid by Beijing to take control of locally developed railways and strategically flawed military repression added to widespread elite and popular discontent. Inchoate regional disturbances led to open revolt and eventually revolution. By the end of Xinhai the young emperor Xuantong 宣統 (also known in English as Henry Puyi) had been forced to abdicate and a Republic of China had been declared. A hundred years on the Xinhai remains a controversial period. The year 2011 started with Ma Ying-jeou 馬英九 in Taiwan lauding the Xinhai centenary for providing an occasion to celebrate democracy, modernity and social progress. On the other side of the Taiwan Strait reflections are not quite as sanguine. The previous official monopoly over the interpretation of history has long since been undermined. At least for the engaged public, the intelligentsia and the web-savvy, online forums provide unprecedented outlets for semi-public debate over the state of the country and its future. In these, as well as in the confines of more covert deliberation, the promise of the past continues to haunt the present. Despite the realities of unflagging one-party rule, groups with widely different political agendas gather, talk and plan for an uncertain future. The agendas of the brutalists, party reformers, neo-liberals, abstract social democrats, Maoists, born-again Warring States fascists (or those with views reminiscent of the war-era Zhangguoce pai 战国策派) and so on have little in common, yet they share a profound unease over the fact that the very reforms that have transformed life for countless people have also given license to egregious official behaviour. While there are those who want to see an ever stronger state willing to forswear the lure of global capital, those of a more liberal bent argue that substantive political and legal reforms are, today as in the past, urgently required to limit the party's control over social life. For them only such changes could hope to ameliorate rising social tensions, iniquities and abuses of power in the long run. Even the top echelons of the party-state cannot ignore these discussions; all are aware that when it comes to the country's political future, the past is not a foreign country. They know that when people speak of the political stagnation, corruption and mismanagement rife in China today they are hearing eerie echoes of another era—that of the late Qing (wan Qing 晚清). In the dying years of the Qing empire issues of national sovereignty and territorial integrity played a significant role in the vociferous rise of a new nationalism, and the agitation among elites and the populace at large for increased national assertiveness. In the Features section of this issue we introduce the work of younger scholars in a section called 'From the Edge'. Compiled by David Brophy and his colleagues this material focuses on the borderlands of the Qing empire during the years of tumult surrounding 1911, just as in New Scholarship Robbie Barnett offers a reflection on Owen Lattimore and the abiding importance of understanding China's still, and crucially, restive 'peripheries'. Also in Features we offer an overview of Xinhai-related Chinese-language publications from the site 1510 (Yiwu Yishi Buluo 一五一十部落, at: http://my1510.cn/). This compilation reflects the wealth of new material on the Xinhai period that has appeared during this year. Various monographs, edited volumes and book series revisit historical personalities, the origins of the revolution and its complex and contradictory repercussions. An overview of discussions of Xinhai in the Chinese popular media is provided in selection of material from the CIW-Danwei Online Archive. In this section we also present a sample of views on Xinhai in Chinese from the noted historians Lei Yi 雷颐, Yang Guoqiang 杨国强 and Qin Hui 秦晖, gleaned from the leading Xinhai-related websites Xinhai Geming wang and Xinhai Geming. Jane Leung Larson traces the history of the Chinese Empire Reform Association (Baohuang Hui 保皇會) through documents. We reprint a study of the rise and fall of the queue in Qing and early republican history by Michael Godley, while Charles Horner and Eric Brown consider the Xinhai and its immediate relevance to understanding China today. Sang Ye 桑曄 offers five sketches from the Xinhai period that reflect some of the more comic aspects of what was a precipitous revolution. In Articles we publish an oral history interview by Sang Ye with a teacher in Guangxi province that offers a family history from the late Qing period to the present. We also present the Seventy-second Morrison Lecture at ANU. Given by Linda Jaivin in July 2011, the lecture depicts the world of George E. Morrison, after whom the series was named. Morrison was, among other things, an adviser to Yuan Shikai, president of the new republic, and in 1915 he persuaded Yuan to leak news of Japan's notorious 'Twenty-one Demands', something that would help fuel the mass protests and student radicalism of the May Fourth era. As Linda points out, he was not the only Australian to play a role in the Xinhai era. Another Australian journalist, W.H. Donald, helped Sun Yat-sen draft the English version of the manifesto of the nascent republic. Another dimension of the relationship between China and Australian in that period of upheaval was Liang Qichao's 1900 visit to the Antipodes, discussed in this section by Gloria Davies. Evans Chan's new film 'Datong: The Great Society 大同: 康有爲在瑞典' is also introduced in this section, and we update readers on an artist whose precipitous detention and sudden release reflect the shaky workings of China's authoritarians. T'ien Hsia carries the first of Pierre Ryckmans' 1996 'Boyer Lectures', reprinted with permission, while Scott Seligman recounts a fascinating episode from early twentieth-century New York history involving the Jewish and Chinese communities on Manhattan's Lower East Side. This section also reproduces the editor's inaugural CIW lecture entitled 'Australia and China in the World: Whose Literacy?'. In New Scholarship David Brophy's translations from the Russian Muslim press provide an account of the Xinhai uprising in the far western reaches of the Qing empire, while Peter Zarrow gives a digest of a panel devoted to 1911 at the Association of Asian Studies in early 2011. We finish with a report on an exhibition of China-related Jesuit books at Boston College by Jeremy Clarke SJ. Since the 1990s in particular discussions have reemerged over whether China's century of mass revolution (geming 革命) was misbegotten, and whether the ethos of systemic rupture and radical totalizing change led to a series of historical miscalculations and disasters that favoured the ambitious and unscrupulous while doing little to realize the promise of the ideologues. In revolution's stead gradual top-down reform (gaige 改革), essayed but unsuccessful in the late-Qing era, and renewed again from the 1970s, is seen as providing the only sustainable formula for such a complex and restive country to remain stable while essential and fundamental changes are wrought. Among some a nostalgia for empire reaffirms such timely and useful revisionism. Such waves of nostalgia are as much a result of China's relative socio-political stability and economic reemergence as they are of commercially manufactured mass memory and local identity politics. A 'Chinese story' is being developed that uses a cultural and intellectual pastiche feeds from various visions of greatness dating from the eras of the dynastic past, the republican period as well as people's republic. It is a story that turns the jostling variety of China's pasts into a modulated account; it well serves the needs of a party-state an overwhelming priority of which is to maintain stability under its tutelage. Some would argue that it all started with the railroads. In 1861, China entered its first period of opening and reform—it was called a dynastic renewal back then, and it was forced on the Chinese empire by relentless Western trading powers. For the past 150 years, the country has since experienced what is best thought of as a long durée of reform and modernization. In 1861, in the wake of the ignominious defeat and treaty negotiations over the Second Opium War with Britain and France, the Chinese government launched a series of diplomatic and industrial reforms. It was then that new transportation and telecommunication systems came to be seen as integral to the industrial rise and military build up of the empire. 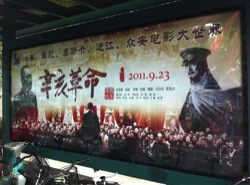 Next month, on 10 October 2011, the People's Republic on the mainland and the Republic of China on Taiwan will commemorate in their disparate ways the centenary of Asia's first modern revolution, the Xinhai Revolution of 1911. What was a disheveled uprising in the provincial capital of Wuhan became a revolutionary movement that led to the toppling of a dynastic order that had existed for over two millennia and to the founding of a fragile democracy. The Xinhai Revolution has complex and numerous causes that are still hotly debated in the Chinese media and by scholars today. One of the immediate causes of the uprising that led to the momentary end of authoritarianism in China, however, was a popular rebellion over railroads. In early May 1911, the Qing dynastic government began to nationalize the railroads which had been built with local funds—an activity that had brought together the local gentry and capital in both profitable and socially worthy industrial activities. Protests to protect the railroads against their takeover led to mass rebellion in Sichuan province and efforts to quell those riots left the city of Wuhan virtually defenseless. The revolutionaries seized the opportunity and a revolution was born. By early 1912 the last emperor, Xuantong, also known as Henry Puyi, had abdicated and the Republic of China was born. 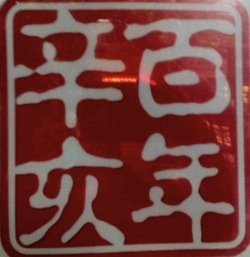 In the early years of the Republic of China, a national strategy was developed for the modernization of the country. It included a vast rail network. In March this year, a group of historians working on China gathered at the annual Association of Asian Studies in Hawaii to discuss China's 'prosperous age', or shengshi 盛世. The group included William (Bill) Kirby, an historian of Republican China at Harvard University (Bill's remarks were published in the June 2011 issue of China Heritage Quarterly). In his speech Bill noted that the republican plan for a national railway network that would bring a new unity and material prosperity to China had only been realized in recent years with the creation of the high-speed railway grid in the People's Republic which was, until the July 2011 Wenzhou disaster emblematic of rapid transformation. While the railways continue to develop, if somewhat more cautiously, the disquiet felt by Chinese people over the government's authoritarian approach to modernization and development at all costs is being voiced more loudly, and vociferously than for decades. In this commemorative year, railroads have featured prominently in China's national life once more. 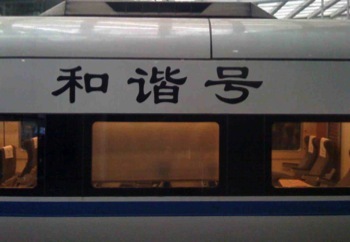 On 27 September as editorial work on this issue of China Heritage Quarterly was being finalized a serious incident in the Shanghai subway system left dozens seriously injured and raised renewed fears of the speed and quality of the construction of China's mass transit system. Only two months earlier, on 23 July, two high-speed trains travelling on the Yong-tai-wen railway line collided on a viaduct in the suburbs of Wenzhou, Zhejiang province. The two trains derailed each other, and four cars fell off the viaduct. Forty people died and nearly hundred were injured. You ask, why are they acting like a bunch of lunatics? They think they're the picture of restraint. You ask, why can't they tell black from white, fact from fiction? They think they're straight shooters, telling it like it is. You ask, why are they running interference for murders? They think they've thrown their friends under the bus. And they're ashamed. You ask, why all the cover-ups? They think they're letting it all hang out. You ask, why are they so irretrievably corrupt? They think they're hardworking and plain living. You ask, why are they so infuriatingly arrogant? They think they're the picture of humility. You feel like you're the victim. So do they. 'Every now and then, there's an accident. The top leaders all show how worried they are. We make someone available to answer journalists' questions. First we say we'll give the victims 170,000 yuan apiece. Then we say we'll give them 500,000. We fire a buddy of ours. We've done all that, and you still want to nitpick? How could you all be so close-minded? You're not thinking of the big picture! Why do you want us to apologize when we haven't done anything wrong? It's the price of development. 'Taking care of the bodies of the dead quickly is just the way we do things. The earlier you sign the confidential document agreeing to cremate your loved one's body, the more money you get; the later you sign it, the less you receive. [A correction to the original translation.] Our pals in the other departments—the ones who knock down all the houses—taught us that one. Burying the train car was a boneheaded move, true, but the folks upstairs told us to do it. That's how they think: if there's something that could give you trouble, just bury it. Anyway, the real mistake was trying to dig such a huge hole in broad daylight, and not talking it over with the Propaganda Department beforehand, and not getting a handle on all the photographers at the site. We were busy, ok? Society has people of means, and those without. There's people with power, and those that have none. And yet everyone thinks they're a victim. In a country where everyone's the victim, where the classes have started to decouple from one another, where it's every man for himself, in this huge country whose constituent parts slide forward on inertia alone—in this country, if there's no further reform, even tiny de-couplings make the de-railings hard to put right. The country's not moving forward because a lot of them judge themselves as if Stalin and Mao were still alive. So they'll always feel like the victim. They'll always feel like they're the enlightened ones, the impartial ones, the merciful ones, the humble ones, the put-upon ones. They think the technological drumbeat of historical progress is a dream of their own making. The more you criticize him, the more he longs for autocracy. The more you piss him off (gao mao 搞毛), the more he's nostalgic for Mao.